It's funny this recent Dr Who obsession of mine. 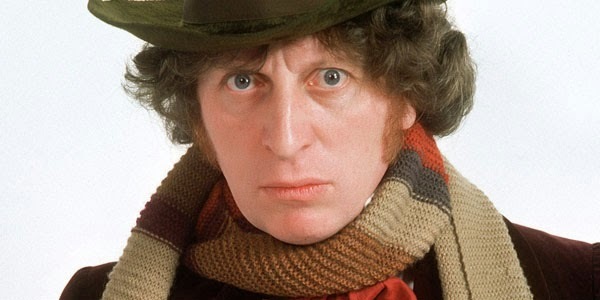 I was born in 1970 and my first experience with Dr Who, probably circa 1976 or so, was Tom Baker. That dude scared the crap out of me, and lets not get into the Daleks You gotta remember it was the 70's and there was all that icky orange, and brown and bad lighting. Plus the Dalek's were kinda scary to a big wuss like myself (though, lets face it, the Dalek's kinda looked like garbage cans with toilet plunger hands - not exactly the thing of normal peoples nightares) It really was creepy looking, and obviously left me scarred for life LOL! . Every-time the commercials for it came on with that freaky music I would rush to the tv (yes no remotes back then you young whipper snappers) and change the channel as quickly as possible. Skip forward a few more years (yes I am old and stubborn, thank you very much) and my pals, Natasha and Jenn, would regularly tell me how awesome the show was and how I NEEDED to watch it. They even tried to get me watching by mentioning how hot this John Barrowman guy was. As usual I totally ignored them. Another year later I had moved to Calgary and got a job with Chapters. As you probably won't be shocked, many of my co-workers were also Dr Who lovers (Refuse to use the term Whovian). And once again, they all tried to get me to watch with no success. Well 2012 came along and I was heading to the Calgary FanExpo . When I mentioned to Jenn and Natasha that John Barrowman was coming to the Expo, they squeed and said you HAVE to go see him. Decided that if I could, I would try to get a picture of Barrowman signed for Jenn, who was coming to visit me later in the year for her birthday. Wasn't going to go out of my way, but figured I would think about trying. Later on in the day I was waiting in line for two hours for my then pretend boyfriend, Nathan Fillion. As there wasn't much to do (and the people around me were not very chatty), I people watched all of those in line for Barrowman, who was in the next booth from Fillion. Every single person leaving his line was giddy and had the biggest smiles you had ever seen. I started watching Barrowman (line was starting to speed up) and he looked at each and every one of his fans and interacted with them. For someone who has been to tons of these types of events, that if a very rare thing to see from an actor. After meeting Fillion (if bored, here is my recap of that) I rushed over to Barrowman's lineup to chat with him. He was truly delightful to chat with and I promised him that since he was so lovely I was going to purchase a photo op with him. One of the best photo ops I have ever taken part in. Once again each and every person in line he took the time to play around with and even suggested different poses. He was so charming and handsome and unfortunately for all of us ladies, gay. Damn, all of the really good ones are gay aren't they. I bet you he would be a true delight to hang out with -- call me John, ok? Even after this, it was almost a full year till I finally watched my first episode of Dr Who. Was feeling a little sick one night and couldn't read so I was flipping through Netflix (even-though when I moved to YYC almost 2 yrs ago, Natasha had gifted 5 seasons of Dr Who to me as a present) and figured what the hell, I will try an episode. Fell in love with Christopher Eccelston and Dr Who right away. The special effects were cheesy, but that was part of the charm. And god I love British television, everyone is so real looking, not a plastic (tee hee first episode I saw) looking one in the bunch. Fast forward six weeks after that and I had gone through 7 seasons of the new incarnation of Dr Who and am now a huge fan. Totally kicking myself for never having listened to all those wise Dr Who fans over all the years. See I can admit when I am wrong. I am not sure why I love it so much, but I do. Each and every episode (have only been bored by one episode, and disliked another one) hooks me in and I am bereft when it is over. Also Nathan Fillion is now no longer number 1 on my Top 5 of hot celebrities. He's down to #2 after David Tennant (sorry feel rather unpatriotic not having a Canadian as #1, but hey Tennant IS Scottish and I have weakend Scottish blood in me -- Paternal Grandfather and Maternal Great Grandfather Scottish). Have enjoyed watching some other Tennant's performances (he was brilliant as the lead in Richard II). If you get a chance also check out his performances in Decoy Bride, Traffic Warden, Fright Night, and Much Ado about Nothing. Haven't seen any of his other performances, but don't worry, I will eventually. Also check out some of the interviews on youtube with him, and you will understand why he is my new pretend boyfriend. My favorite Doctor is Tennant, followed by Eccleston and than Smith. My favorite companions are Rose, Donna, Amy/Rory, River Song and obviously Captain Jack. The episode Blink and Vincent and the Doctor should be viewed by everyone, not just Dr Who fans. Tom Baker, who used to inspire fear in me, actually made me cry during an episode of the show. Dr who has brought new friendships into my life. And no we don't just talk about Dr Who. Loved this! We are Doctor Who fanatics at our house. The British husband brought a love of The Doctor with him when we married and so our kids have grown up with it. His and our oldest son's favorite Doctor is Tom Baker. Mine is John Pertwee (3rd), followed by Eccleston and McGann. Liked Tennant, loved Smith. Can't wait for Capaldi. I liked Rose, love River. We have a Dalek and a TARDIS on our Christmas Tree. When my youngest son walks in the door after school, he always greets me with, "Hello Sweetie". I refer to my boys as "son of mine". Yep, love the Doctor! I'm not sure how I stumbled into your blog, but I'm glad I found it! Jealous. I would love a TARDIS backpack! Never fear, your family may just come around one of these days. Isn't Capaldi fantastic? Love him already.